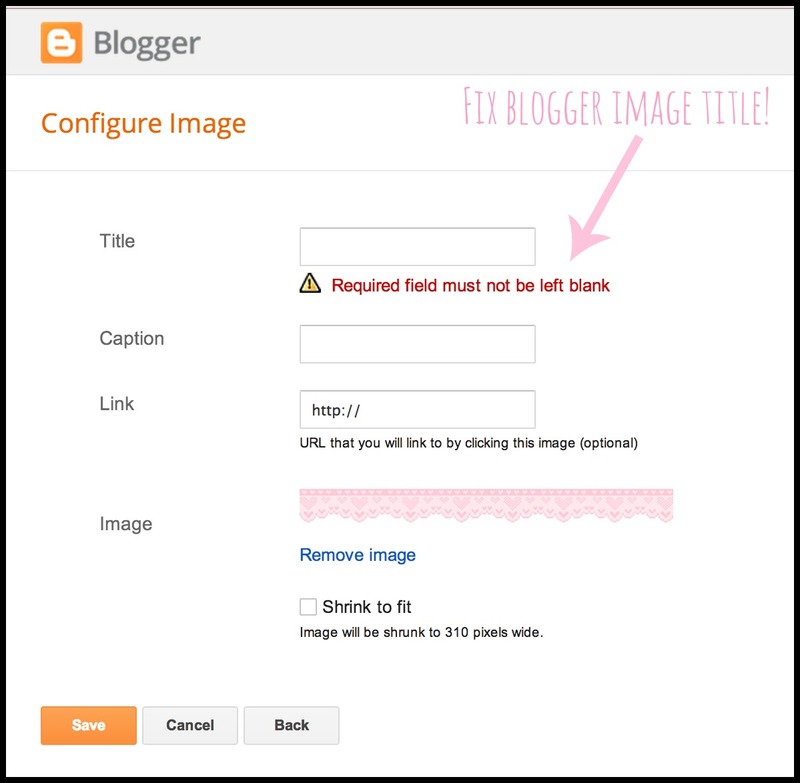 If you mess around with your blog design a lot, or even if you've just gone to make tweaks in the last couple of months then you'll have probably noticed that you can no longer display an image widget in your sidebar without entering a title first. Typical Blogger, they make everything more difficult than necessary- anyone else feel like tearing their hair out when template/ layout type things go wrong? You can't just enter a space, and while you could shut up the warning notice with a full stop if you're anything like me seeing a big old full stop above each of your image widgets will be enough to drive you crazy. Luckily there's a very easy fix. This will allow you to post your image, but wont display a title or an unnecessary gap. I've read that this is a bug with Blogger, but it seems to be an ongoing issue and so I thought I'd share this little trick for everyone who was getting as annoyed with as I was. I hope it was helpful! Have you ever experienced this issue? Thank you for such a useful tip!!! I am fairly new to blogger, so I haven't changed very many settings yet, but I'm sure this will come in handy soon. Normally it's Bloglist1 or Labels1. Those are the only two I have run in that does that. I had this problem too with the images. I am going to try it right now! OMG thank you so much!! You genius this has been annoying me so much I had a little full stop as my titles haha. You life saver!! Been trying to do this for AGES! :) Thank you! Thank you for this tip! I just found this post through a Google search because I was having this issue. Problem solved! You're Saviour ! Thank you so much ! VERY annoying bug, especially for a non-techie like me, but your fix was so easy and it worked! Thank you! omg... you are a miracle worker !